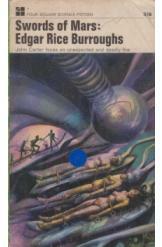 Swords of Mars Edgar Rice Burroughs Sci Fi. Book is in good condition, all pages intact. The time has come for John Carter, the earthman hero of Mars, to stamp out the planet's ruthless gang of organized assassins. Pitted against the assassins' guild's leader, the brilliant and ruthless inventor Fal Sivas, John learns too late that the stakes have risen. Fal has invented a device that will allow he and his underlings to get offworld, and he plans to kidnap John's lover Dejah Thoris and bring her with him. Part of the A Princess of Mars series.